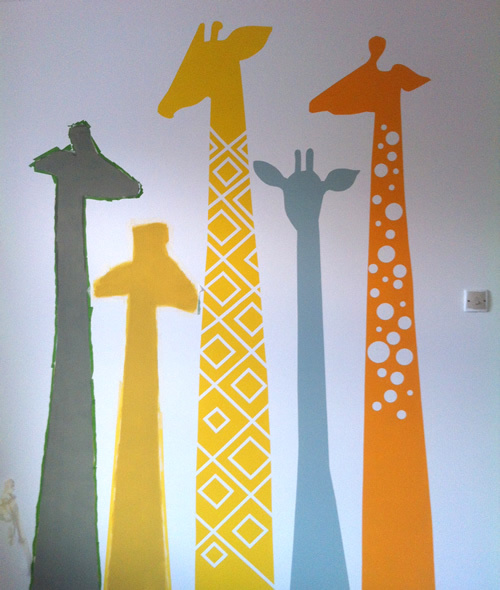 If you’ve been following my Facebook page recently, you’ll know all about the five giraffes I painted on my sons bedroom. Read on to find out how I did it. 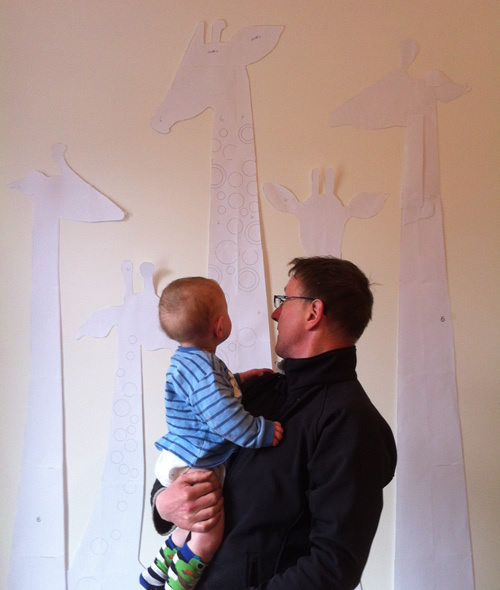 The day after Milo was born, Colin visited us in the hospital and on his way he found a twig in the shape of a giraffe – and so our obsession began. We saw giraffes everywhere, found lots of giraffe toys, visited the giraffe enclosure at Belfast zoo etc etc. 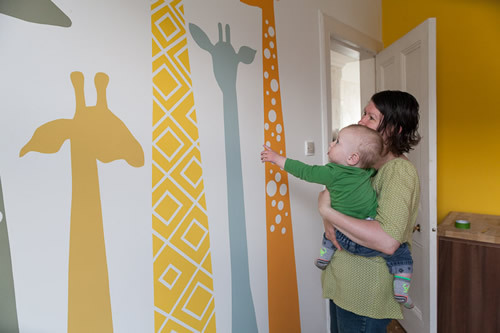 So when it came to decorating Milo’s room I knew I wanted to paint a giraffe on one of his bedroom walls – maybe do a mural. 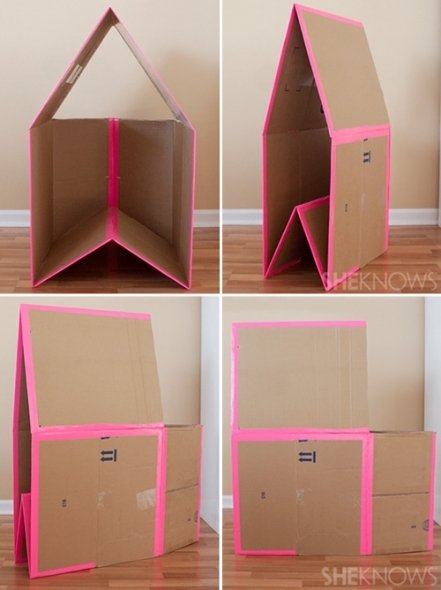 I didn’t know what form this would take until I came across this image on Pinterest. I’m not brilliant at drawing by hand and didn’t fancy drawing directly on the wall as I knew it would all go horribly wrong. 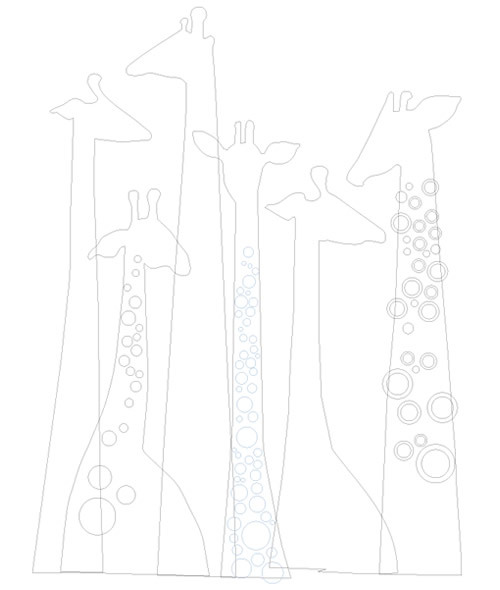 So I imported the image into Adobe Illustrator and drew all 6 giraffes on screen – like this. I made the document, and therefore the illustration, actual size and then cut it up. By that I mean that I created a rectangle the size of an A4 sheet (297mm x 210mm) and duplicated this across the whole illustration. 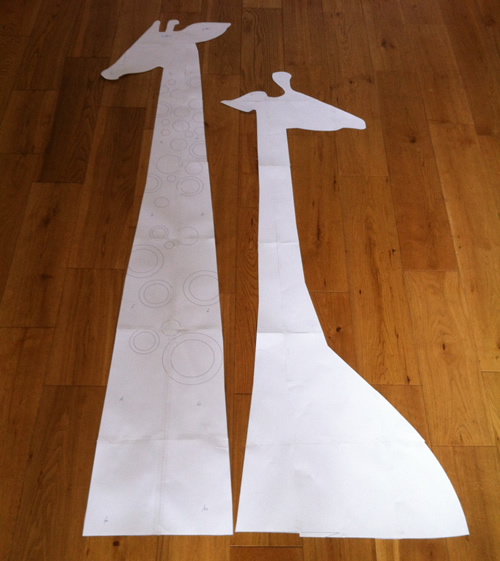 I then used the pathfinder tool to cut the image up into A4 sheets by selecting one giraffe at a time with the overlayed A4 sheet templates. 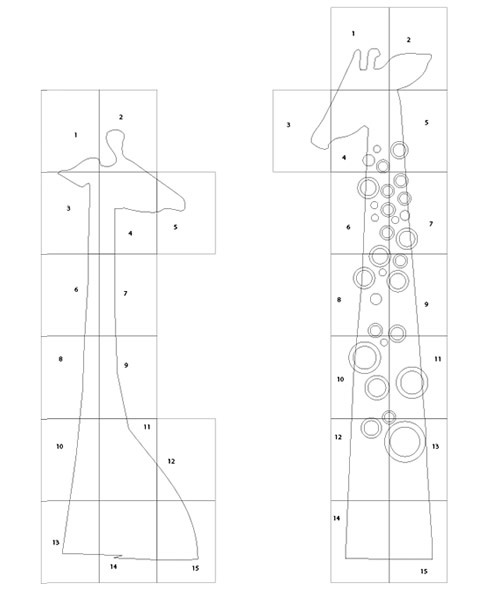 The image below shows two of the giraffes with the A4 templates laid over the top of them. 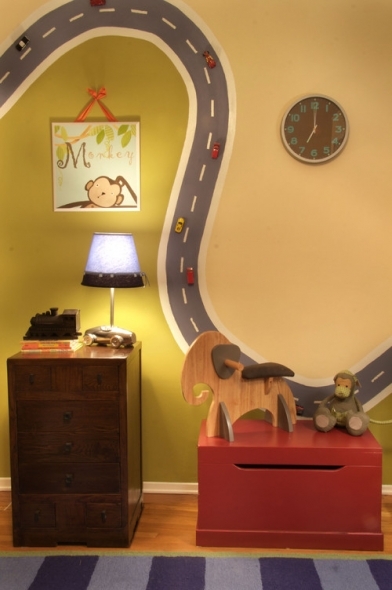 With my 6 cut outs and some tape, I was then able to mess around with positioning on the bedroom wall until I was happy with the layout. 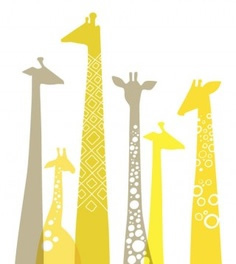 I decided to ditch one of the giraffes and also switched the head on another and settled with these final five. 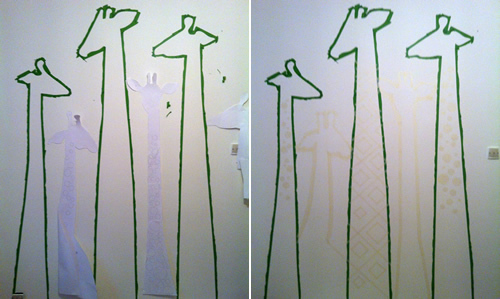 I then used Frog Tape to mask the outline of each giraffe. 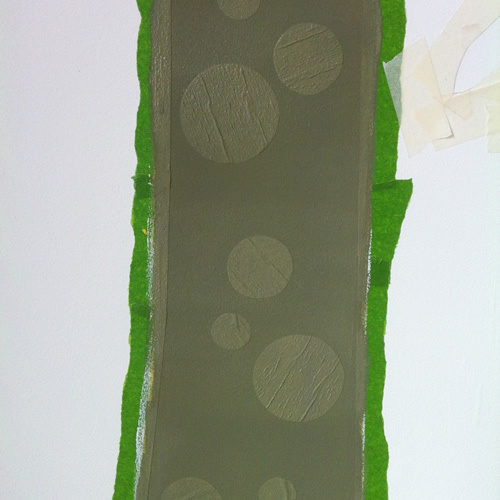 Frog Tape is green masking tape which is far superior to the usual stuff you can buy. I was really worried about paint leakage underneath the tape, so I thought if I used Frog Tape I could minimise the risk. The quality of the next few images is a bit rubbish as I took them on my iPhone late at night so the light was far from good. 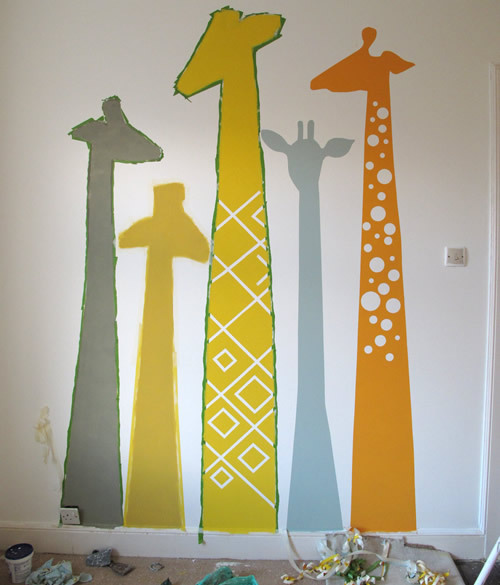 I ran out of frog tape and had to revert to normal for the last two giraffes and the patterns within the other three, so I decided to try out a tip I found online to reduce the paint leakage. 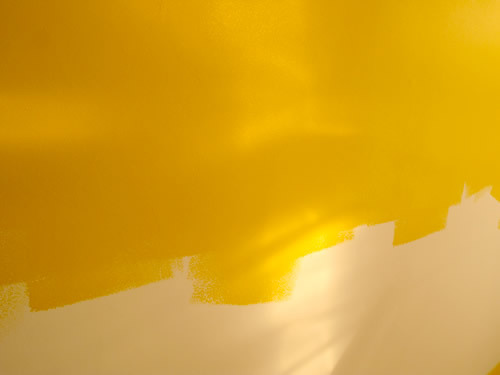 The tip is to use the same colour paint as your wall for your first coat. 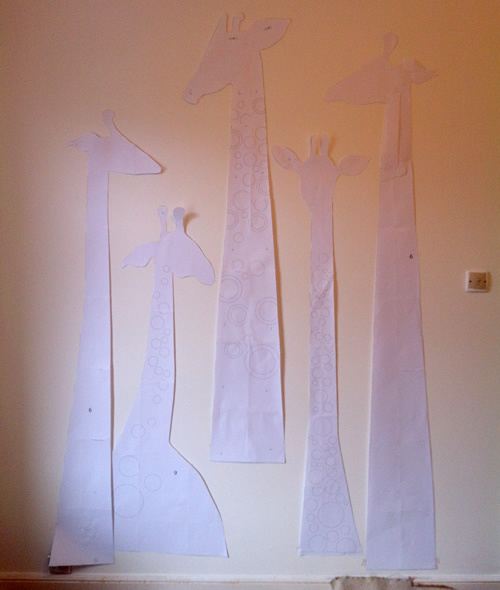 So as my wall is white, I painted all the giraffes white initially. I think this did the trick as I only had a couple of really tiny leakages here and there and they were easy to clean up with a craft knife. 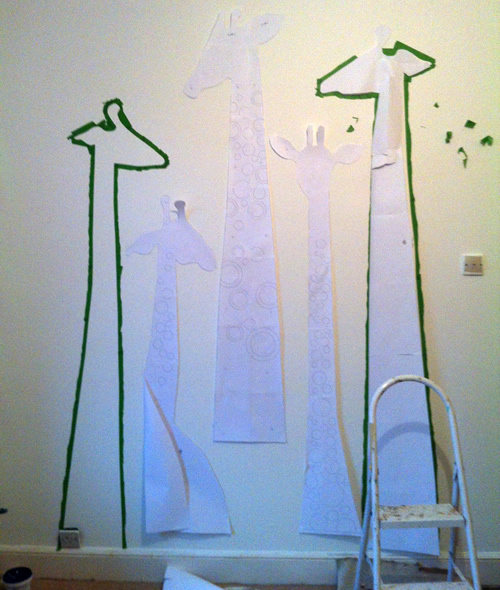 With all the giraffes masked out and the patterns added, I painted my first coat of white paint and left this to dry. 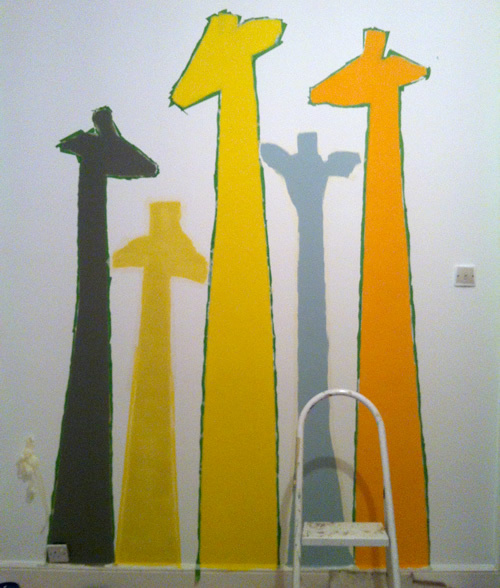 It was then a matter of deciding on the colours for each of the giraffes and painting each one in turn. 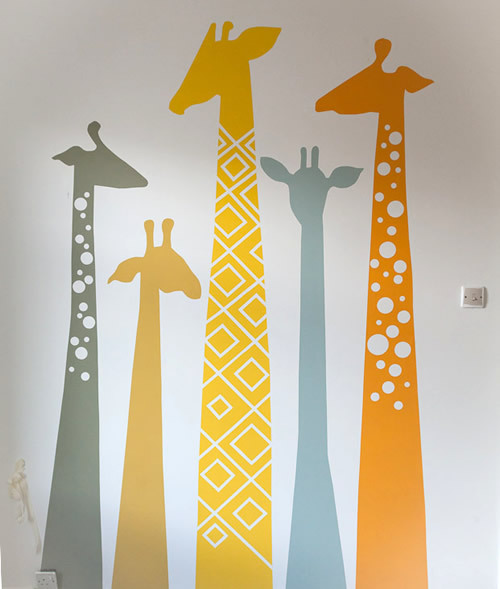 I wanted one yellow like the yellow feature wall, one orange and one grey (to match the floor we’re going to lay) but hadn’t decided on colours for the other two. 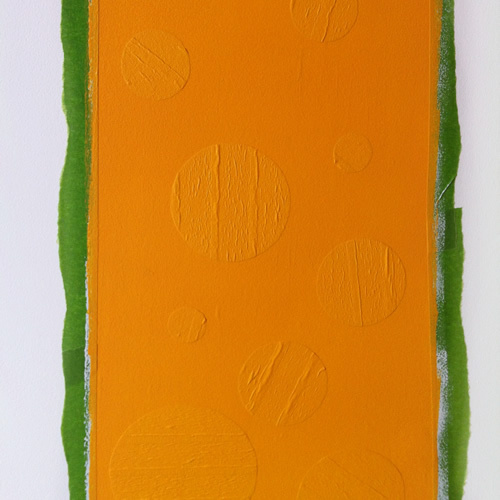 I mixed all my paints from tester pots, using the main yellow as a connecting factor between them all. As I was deliberating on the two final colours Colin found a bag full of tester pots that we saved from when we were selecting colours for the Kitchen and Bathroom walls, so I was able to mix up a couple of shades from them and also make the grey one lighter as after the initial paint dried it seemed far too dark. 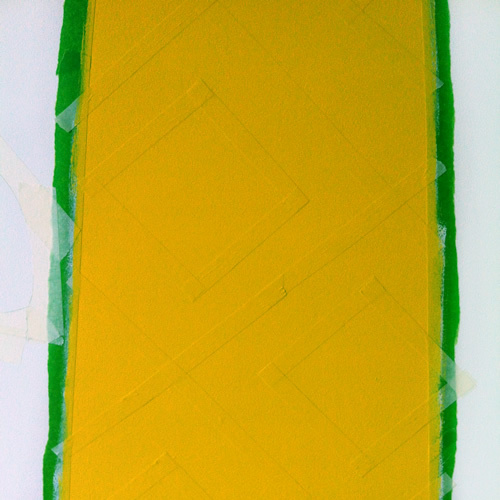 I was really worried when I saw the normal masking tape buckled up as seen in the three images above, but I soldiered on and just crossed my fingers and hoped the paint hadn’t leaked. I was so chuffed with what I discovered underneath! 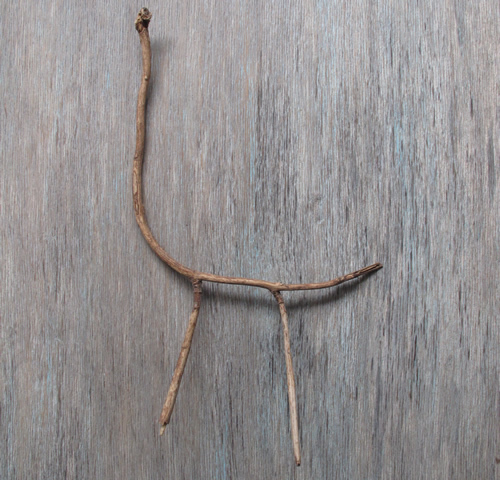 Oh and by the way – we still have the giraffe twig – it’s what started the whole Giraffe obsession – I hope to hold onto it for ever. 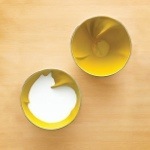 This entry was posted in Tutorials and tagged Milo.